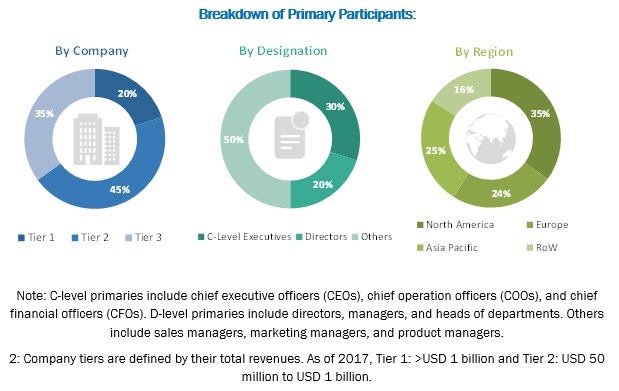 [110 Pages Report] The ligation devices market is projected to reach USD 1,189 million by 2024 from USD 876 million in 2019, at a CAGR of 6.3% during the forecast period. Growth in this market is mainly driven by the increasing prevalence of diseases requiring surgical treatment, especially minimally invasive surgery (MIS). However, the high cost of ligation devices is a major restraint for this market, particularly in emerging countries. By product, the ligation devices market is segmented into handheld instruments and accessories. The accessories segment accounted for a share of 68.2% in 2018 and is anticipated to grow at a CAGR of 6.9% during the forecast period. This growth can be attributed to the increasing number of surgical procedures, especially in emerging markets. 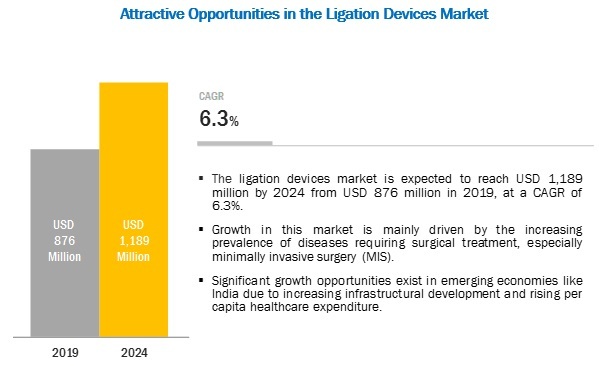 Based on applications, the ligation devices market is segmented into gastrointestinal & abdominal surgeries, gynecological surgeries, cardiovascular surgeries, urological surgeries, and other applications such as wound, ENT, and cosmetic applications. The cardiovascular surgeries segment is anticipated to drive growth in the market at a CAGR of 6.9% over the forecast period. This growth can be attributed to the increase in the incidence of cardiovascular diseases. Additionally, with technological advancements in cardiovascular robotic surgery, the demand for ligation devices is anticipated to increase. The ligation devices market is geographically segmented into North America, Europe, Asia Pacific, and the Rest of the World (RoW). While North America dominated the market in 2018, Asia Pacific is expected to register the highest CAGR in the market during the forecast period. Growth in the APAC region is largely driven by the large patient population and increasing infrastructural development in the region. Some of the prominent players in the ligation devices market are are Ethicon (Johnson and Johnson) (US), Teleflex Incorporated (US), Olympus (Japan), Applied Medical (US), ConMed (US), Cooper Surgical (US), Genicon (US), Grena Think Medical (UK), B.Braun (Germany), and Medtronic (Ireland). Johnson & Johnson (Ethicon) is the largest player in the ligation devices market. The company focuses on the development of devices, consumables, accessories, and software required to perform minimally invasive surgeries and open surgeries. The company also invests a significant amount on research and development activities. In 2018, it spent ~7% of its revenue on R&D activities. Medtronic (Covidien) is a major player in the ligation devices market. The company has a global distribution network and a good brand reputation among end users. The company’s strong presence and wide distribution channels across the globe have helped it to maintain its leading position in the ligation devices market. In 2018, Genicon, Inc. entered into a distribution agreement with Greenpine Pharma, China to distribute its complete range of products in China. In 2017, B.Braun opened 5 new production and administration facilities in Penang to cater to end users in Malaysia. The company aims to manufacture medical devices for infusion therapy, pharmaceutical solutions, and surgical instruments in these facilities. What are the growth opportunities in the ligation devices market across major regions in the future? Emerging countries have immense opportunities for the growth and adoption of ligation devices. Will this scenario continue during the next five years? Where will all the advancements in products offered by various companies take the industry in the mid- to long-term? What are the various ligation devices and their respective market shares in the overall market? What are the new trends and advancements in the ligation devices market? 12.3 The Cooper Companies, Inc. The study involved four major activities to estimate the current size of the ligation devices market. Exhaustive secondary research was done to collect information on the market and its different subsegments. The next step was to validate these findings, assumptions, and sizing estimates with industry experts across the value chain through primary research. Both top-down and bottom-up approaches were employed to estimate the complete market size. Thereafter, market breakdown and data triangulation procedures were used to estimate the market size of segments and subsegments. In the secondary research process, various secondary sources such as annual reports, press releases & investor presentations of companies, white papers, certified publications, articles by recognized authors, gold-standard & silver-standard websites, regulatory bodies, and databases (such as D&B Hoovers, Bloomberg Business, and Factiva) were referred to in order to identify and collect information for this study. After arriving at the overall market size using the market size estimation processes the market was split into several segments and subsegments. To complete the overall market engineering process and arrive at the exact statistics of each market segment and subsegment, the data triangulation and market breakdown procedures were employed, wherever applicable. The data was triangulated by studying various factors and trends from both the demand and supply sides in the ligation devices industry. Ethicon (Johnson and Johnson) (US), Teleflex Incorporated (US), Olympus (Japan), Applied Medical (US), ConMed (US), Cooper Surgical (US), Genicon (US), Grena Think Medical (UK), B.Braun (Germany), and Medtronic (Ireland).